While on paper the top quarter of the draw for the International Championship was seeded to provide a ‘Trump-Walden’ match tomorrow, both were to lose in the opening round with defending champion Ricky Walden crashing out to Tian Pengfei on day one in Daqing. 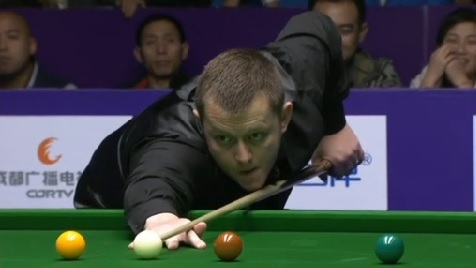 Although Tian was to lose out earlier today to Mark Allen at the last 16 stage, wins against fellow Chinese players Cao Yupeng and Liang Wenbo, in addition to his recent run to the final of the Ruhr Open mean that he will climb back into the world’s top 64 after the tournament. It is worth remembering that Tian was perhaps the play who suffered the most from the transition from a points based ranking list to a prize money system back a couple of seasons ago. Indeed he actually finished the 2013/14 season 50th on the points list, but only 66th on the money list and so was relegated from the circuit. It was though Mark Allen who came through a comfortable 6-1 winner when the two met today and the tenth seed is now into his second consecutive ranking event quarter-final. Having already seen off close friend and countryman Joe Swail, as well as Kyren Wilson, who defeated Mark on his way to the Shanghai Masters title last month, the 2014 runner-up looks to be playing some good snooker this week. Next up for him will be Thailand’s Thepchaiya Un-Nooh, who is also into his second straight quarter-final as he continues his increasingly rapid progress up the ranking list. Looking back at his run to the last eight, remarkably the Thai has won all four of his matches so far in deciding frames, today seeing off Chinese prodigy Zhou Yuelong by a familiar 6-5 scoreline. Though he lost today, Zhou once again demonstrated why for me he has a strong claim to the most promising young player in the game at the moment by making it to the last 16 of a full-ranking event for the first time in his career. His reward will be a place in the world’s top 64 for the first time in his career when the rankings are revised next week, while he has already made almost certain of his tour card for next season as a result. As for the Allen and Un-Nooh quarter-final, the two only have one previous meeting to their name at this year’s Shoot Out and we have not seen either on the TV table so far this week, but perhaps Mark will be hoping that they will not require a deciding frame given Thepchaiya’s record so far this week! Moving down to the second quarter and we find Marco Fu and David Gilbert, the former so far mounting a strong defence of the runner-up points that he is defending from 2013, while Gilbert continues his strong form following the recent Ruhr Open. Amongst those to have fallen in his section was Ding Junhui, who could not sustain his form following victory at the Haining Open last week and fell to Ryan Day in yet another decider between the two at the last 32 stage. Day himself then lost out to Gilbert 6-4 in today’s final match of the last 16. Marco Fu’s opponents included Jimmy Robertson, who can at least take some consolation from the fact that he was able to make it through to the last 16 of a ranking event for the first time in his career, having previously fallen at the last 32 stage on nine occasions in total. 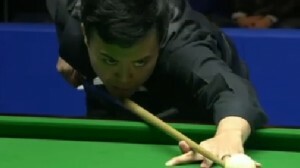 Also in this section, Oliver Lines narrowly fell one match short in his attempts to overhaul father Peter in the world rankings, but nevertheless closed the gap to the world’s top 64 and like Zhou Yuelong, has put himself in a very strong position to stay on the tour at the end of this season. Turning to the bottom half of the draw and we have a mouthwatering quarter-final in prospect between Mark Selby and Neil Robertson, who have both shown much improved form after their respective slow starts to the campaign. 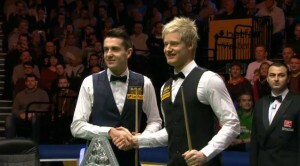 In my opinion the most interesting match-up in snooker at present (their semi-final at the Crucible back in 2014 was one of my favourite matches in recent seasons), their meeting will be one not to be missed during tomorrow’s evening session and it will be fascinating to see who is able to come out on top. Amongst those to have fallen in this section are Michael White and Graeme Dott, but perhaps unusually so far this season, the quarter-final has ultimately gone to seeding and we have a terrific match in prospect. Moving on to the bottom of the draw and we have another top quarter-final in prospect, with John Higgins having dismantled sixth seed Shaun Murphy today with a shock 6-0 whitewash to set up a clash with Joe Perry. While the draw perhaps opened up slightly following world champion Stuart Bingham’s defeat to Yu Delu early in the week, Joe Perry nevertheless has had a tricky run to the last eight, today withstanding a comeback attempt from Ben Woollaston to win 6-5. 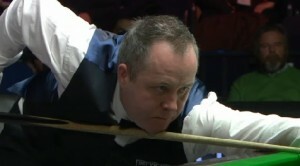 John Higgins too has not had it all his own way in Daqing, with Michael Holt controlling the first half of their last 32 match before the Scot produced yet another timely comeback to win 6-3. Overall then, a very entertaining start to a tournament that appears to have been very well received by the local spectators and players alike, conditions reportedly far less humid than some of the other venues in China.